Aqua Seat Review-Is it the solution to the never closed toilet lid? Does the Aqua Seat Really Work? There are so many products that would be really interesting to do a review on, but we just couldn’t pass up this innovative product that has the potential to put an end to a lot of heated arguments as to who left the toilet seat up! 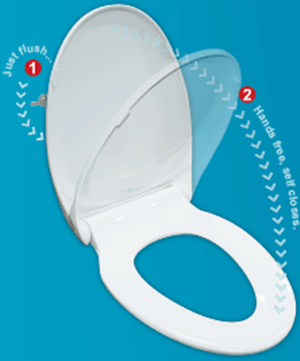 The Aqua seat is comprised of a very innovative mechanism that allows for the closing of the toilet seat all by itself after each use. There are similar products on the market but it seems with most of those you have to give it a closing start first. So if you have to remember to do that then why not just close it all the way. This product we are reviewing today doesn’t need any help in its automatic closing capabilities. The company claims that this product comes with three options. One is the hands free closure that will take place for both the lid and the seat. Or a second option which is a manual operation, and a third choice which is hands free closure of the seat only with every flush. They hype for this product is simple because it addresses one big issue that many have when living in a home with more than one person that uses the bathroom, and that is not putting the seat down. It is usually the women of the house that are the big complainers about this issue, and of course the men who are the culprits. They hype addresses a significant problem and provides a quick solution with the Aqua Seat. You will have to watch the cost carefully as it will depend on what you are ordering.If you order the deluxe kit it is going to cost you about $59.85 plus the shipping and handling which will be about $15. So you order is going to amount to around $75. But if you pay the order in full then you will get free shipping and handling. Otherwise you can pay in four installments but will also have the shipping and handling costs. The Deluxe kit is comprised of the toilet seat and cover with the built in “go and go” technology. Now you also have another option which is you can buy the “go and go” adapter and turn your present toilet seat into an aqua seat. This will cost you $19.95 plus estimated shipping of $14.95, plus you get a second adapter free but you also need to pay the shipping on this. No matter which purchase you decide on you are going to have some installation work. It will either be entirely replacing your present toilet seat and lid, or installing the adapters on the two toilets. Overall we really like the concept of this product as it really does offer a great solution for the common problem of nobody closing the lid on the toilet. As far as the price goes once you really figure out what you are getting for what you are paying, it makes it a little easier to decide if you are getting a good deal or not. We are going to give this product a solid try/buy rating, and the only reason it fell short of the thumbs up is the complexity in the pricing. It can really be quite confusing, so you need to study the promo material well to see what you costs are actually going to be if you just buy the adapter compared to if you buy the entire deluxe set. About the closest we could come to for comparison is the slow close toilet seats. These are not completely automatic as you have to remember to give them a gentle shove. This is our first review on toilet seats so we aren’t able to give you a comparison review, but we have looked at some innovative bathroom accessories in the past with one of them being the Violight UV Toothbrush Sanitizer which gave us mixed feelings. What do you think? Does Aqua Seat work or not? Does Sneak A Poo Really Work? I think there is a more important use for this product by using it in reverse. As a compassionate man I have noticed public unisex bathrooms (trains, small restaurants, etc.) often do have the toilet seat down but splashed with urine as there are men who ate, well slobs. An automatic self raising seat would offer a more practical solution to an actual PROBLEM for my female friends. Having to pull a clean dry toilet seat down before use is a much.more.practical use for this product or one like it.